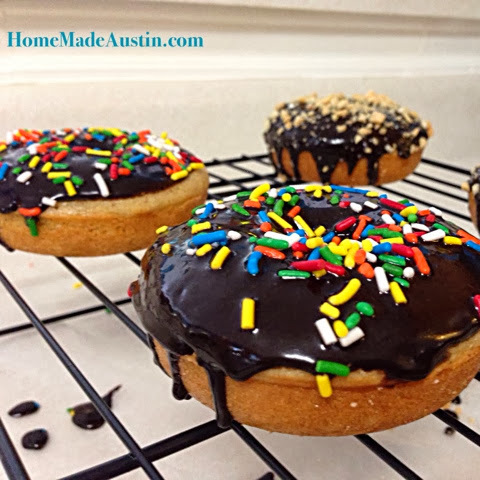 Home Made Austin: Saturday Morning Donuts! Alot of Saturday mornings I wake up craving sweet, fluffy donuts. I don't know what it is about donuts that just makes me happy. I think sprinkles have alot to do with it. Since moving into our neighborhood, we've found a cute little shop that has delicious varieties. So, we indulge quite often. Not so bad on the pocketbook, but definitely not great for the hips. 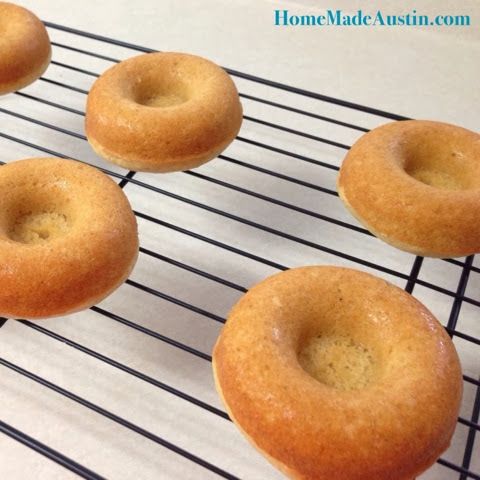 A few weeks ago, I saw a simple, tasty sounding baked donut recipe from Joy the Baker. 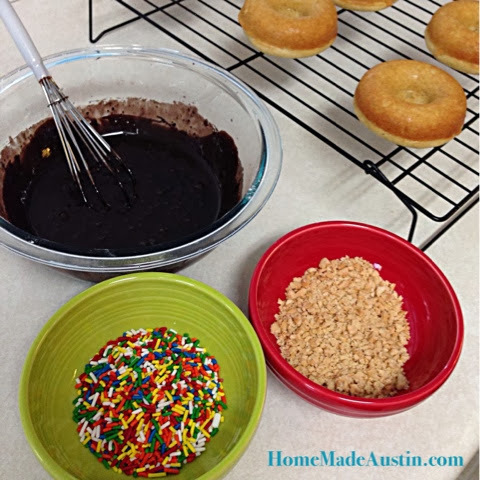 While I'm sure they're not fat or carb free, the idea of baked donuts at home sounded like a great, healthy-ish idea. Last week, while browsing around Bed, Bath & Beyond, using up the last of our wedding gifts cards, I spied a cute little donut pan. I just couldn't resist picking one up. I followed Joy the Baker's recipe to the letter, and it can be found here. The donuts came out airy & soft....most similar to a cake style donut. And the chocolate glaze was spot-on similar to your favorite shop's. We went with traditional toppings, sprinkles & chopped peanuts. They were satisfying & low effort enough that we will definitely be making these again. Probably next weekend. What I'd Change Next Time: I think next time I'll use half the amount of nutmeg, as it was a little too much for our taste. I also think that replacing the nutmeg with cinnamon or doing half & half would be good as well. For variety, I also want to play around with a vanilla glaze & maybe something a little zingy like lemon. And there are a million toppings you could try. 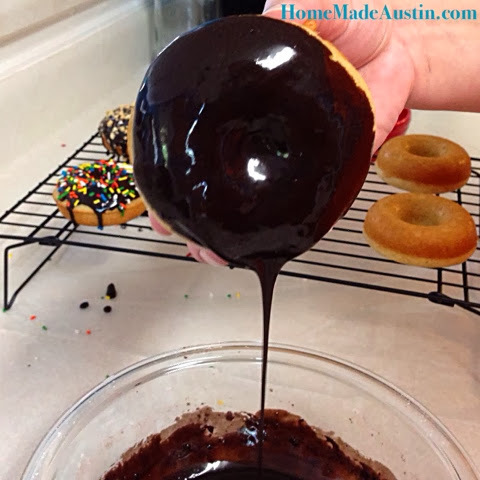 The hardest part of the entire process was waiting for the chocolate glaze to dry. It takes 30 minutes! But definitely a necessary evil.